at Standing Rock in late November. 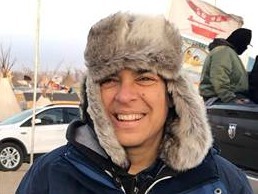 Last November, Oakland Councilmember Rebecca Kaplan braved blisteringly cold weather to protest the controversial Dakota Access Pipeline. The project along with the Keystone XL pipeline, another project strongly opposed by environmentalists, was subsequently blocked by President Obama, only to be set back in motion Tuesday by an executive order signed by President Trump. Just hours later, Kaplan denounced the executive order and sent a letter to CalPERS, the state’s public employees retirement fund, calling for it to divest from companies involved in the Dakota Access Pipeline. Public officials, community leaders and thousands marching in the streets have spoken out against the new president, said Kaplan in the letter to CalPERS. In addition, the project risk poisoning drinking water for the Standing Rock Sioux tribe and desecrating their ancestral lands . Kaplan authored an Oakland City Council resolution opposing the Dakota Access Pipeline. It was approved in September. Posted in CalPERS, Dakota Access Pipeline, divestment, environment, Keystone XL, letter, Oakland, Oakland City Council, President Obama, President Trump, Rebecca Kaplan, resolution, Standing Rock. Bookmark the permalink.